The new NetEnt release Turn Your Fortune™ is quite the one-stop solution for top online slot action, regardless of the type of player you are. 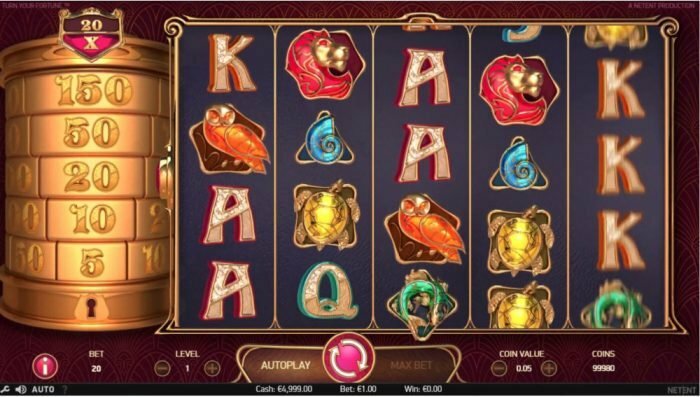 Enthusiastic slot lovers will definitely get a kick out of the intricate gameplay, while high rollers can still hit nice payouts through entertaining features. Gold, riches and fortune are indicated from the initial design of the starting screen. The first thing players see upon entering the Turn Your Fortune™ starting screen is a golden-framed reel set featuring quite a bit of expensive ornaments. This is accompanied by a gold-emphasized perpetuum mobile machine on the left-hand side of the screen, featuring five steps on each of the five levels, and a key lock on the bottom. With looks like that, there’s hardly anyone who can refrain from getting in on the action. In order to make the most of your stake, there are a few basics to learn about this video slot. For one, bet size can range from 0.20 to 20 coins, meaning players of all betting preferences can enjoy it. In order to hit a win, they need to land at least three of a kind of the range of symbols on the 5-reel 4-row grid, featuring 40 fixed paylines. Nine regular symbols appear on the reels, with 4 of lower value – the card suits J, Q, K and A, and five of higher value – animal symbols representing a shell, fish, turtle, owl and lion, all decorated to look a lot like ornamental brooches. A butterfly is the Wild substitute symbol, while an equally ornamental Peacock is used as the Scatter. The slot’s reels additionally feature a key symbol (that appears exclusively on reel 5) and collectives, related to the much desired bonus of the gameplay – the Fortune Wins. The Fortune Wins finally put to play the golden cylinder form on the left side of the slot screen. It has five levels, each containing five steps that denote the coin wins players land as they climb them. Moving upwards these steps is possible by accumulating a given amount on the counter of the determined collectible symbols – the one that hit the win which triggered the actual feature. Fortune Wins payout amount is calculated in the end, with a 20x multiplier standing on top of the perpetuum machine accounted in the win. This feature can additionally appear during both the free spins bonus round, and the Fortune Re-spins. The former is triggered by landing three Scatters on reels 1, 3 and 5; when accompanied with a win, it additionally triggers the Fortune Re-spins. This bonus round has a second screen where players are given the chance to spin a three-tiered wheel. The first level features number 7-13, and the field you land determines the number of free spins you’ll get. The second wheel tier features all 11 symbols, and the one that lands will be the collectible, while the third tier has three keys determining your starting level on the perpetuum machine. Once all is determined, players return to the main screen and spin through their free spins. They collect the specific symbol determined as collectible, and each time the counter maxes out, the perpetuum moves one step up. The lowest level’s steps include 5, 10, 20, 50 and 150 coins, while the highest includes the following steps in coins – 50, 100, 200, 500, and 2,000, and such a move towards the highest level is possible by landing the key on reel 5. Either through a triggering win in this bonus round, or by landing 2 Scatters in the main game, Turn Your Fortune™ players can additionally enjoy Fortune Re-spins. An additional Scatter during the re-spins features awards one more re-spin, while the winning symbol is once again the collectible, with the cylinder machine acting much like during the free spins. With a 96.24% RTP, Turn Your Fortune™ video slot is already a rather attractive gameplay destination. What is more, players are ultimately eligible to hit up to 2000x their initial bet during the Fortune Wins. All in all, if you are willing to Turn Your Fortune for a few spins, it is bound to pay out generously. Turn Your Fortune™ was released by Netent on the 3rd of December 2018! Featured: 10 No Deposit Spins on Turn Your Fortune™! Footage of Turn Your Fortune™ video slot!